A man has been charged with attempted grievous bodily harm and possession of an offensive weapon after armed police were called out in Gwynedd. 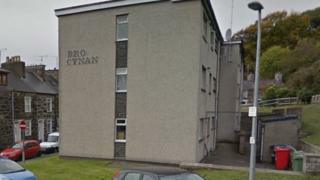 Officers and police dogs were sent to the Bro Cynan estate in Pwllheli at about 13:30 GMT Saturday. A nearby road was closed for more than two hours and people were told to avoid the area. The 23-year-old local man was remanded in custody by magistrates in Llandudno on Monday. He will appear at Caernarfon Crown Court later in April.